Shivering and shuddering,I slowly put on my damp and clammy life jacket. I fidgeted for a while with my buckles trying to make it fit as snug as I could. The life jacket was still wet from the last group but I got used to it quickly. Chris from Water Safety NZ,was going to teach us how to swim and what to do in difficult situations when your in the water. On Monday a pool,that was enclosed by a big white tent and a fence, magically appeared on the netball court next to Tusitala. Finally it was Rm 15’s turn. I couldn’t wait to get in. As I walked slowly into the pool my teeth chattered and I got goose bumps all over my body. Screaming and squealing, I walked off of the platform that was under the water and made a big splash. Luckily the life jacket kept me above the surface. “SSSH”, Chris tried to calm us down. He told the whole class to get into a huddle. A huddle is when you get into a group. Then we had lie down on our backs while holding on to the person next to you. Instead of timing us by counting Chris told us to sing the National Anthem.It was terrible!! Everybody sang out of tune and Miss Garden said that she could hear us all the way from her class. Chris gently spun our circle around while we kept singing hideously. I enjoyed reading about the swimming lesson. I walk past the pool a lot and see lots of classes in there and often wonder what it is really like. Well now I know! I am picking it is pretty cold from all the shivering and shaking words! 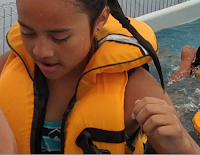 I was amazed that they are able to provide life jackets for everyone, especially across our range of sizes. I do hope that you learn lots and enjoy it this term.